I have often read that restaurant Noma in Copenhagen is the best restaurant in the world now that El Bulli has closed. These all-time-best commendations always annoy me because I always suspect that the real best restaurant in the world is some Thai or Indonesian street stand that makes something out of nearly nothing and does it perfectly. 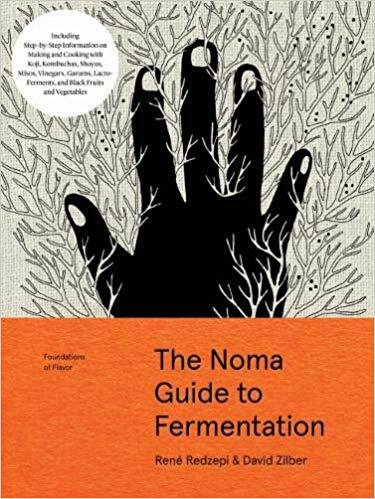 That said, having read Noma’s new guide to fermentation, I am willing to believe that Noma might be the best restaurant in the world, because they have certainly expanded the age-old art of fermentation beyond anything I have previously encountered. The book covers all forms of fermentation except the purely alcoholic ones that produce wines and beers. There are detailed sections on lactic fermentation, kombucha, vinegars, kogi, miso, shoyu, garum, and the enzymatic blackening that produces black garlic and much more if you let it. There are fascinating asides on how to use the resulting liquids and solids in dishes and as seasonings. They observe that, to their own surprise, the variety and depth of flavor produced is so profound that they may become a largely vegetarian restaurant. Many people think of fermented products largely in health terms, a “gut shot” of probiotics. But playing with the Noma ideas, I’m experimenting with the essences that result when fermented products are cooked down. They are no longer live, but they’ Delicious. I love to keep chicken and beef glacé in the freezer to add depth, body, and a suave finish to even the simplest sauces, and cooked-down ferments may fill a similar role. There is commentary on things that I will never intentionally try, such as the culinary use of insects. I’m well aware of all the arguments in favor, but I’m too acculturated against it to approach it with an open mind. So, their cricket garum isn’t going to be an item in my diet anytime soon. But less rigid cooks may want to experiment. Under Noma’s influence, the large insulated but unheated shed that I use for painting has become a busy fermentation facility. I have so many experiments going that I will never have time to write about most of them, so buy the book. I don’t accept review copies, and when I review a book, I paid the same price for it that you will pay. There is no other way that I can realistically assess the value/money ratio. About this one, I can only say that it is very hard to put a price on a book that can invigorate your entire daily cooking routine and open up a new range of flavors.